Dust Attracting Formula. 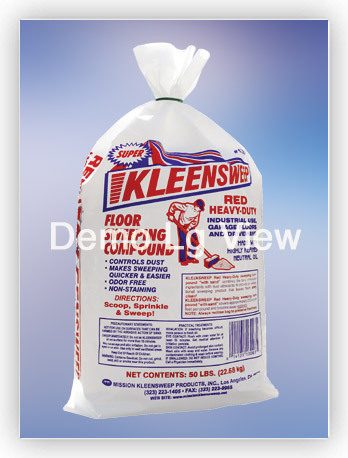 Red Heavy-Duty Kleensweep has been manufactured by Mission Kleensweep Products, Inc. since 1936 and is the number one selling sweeping compound in the West. Easy and economical to use, this is the ideal formulation for sweeping industrial and institutional concrete floors as well as warehouses, garages and driveways. Keeps the dust down. Not for use on floors that can be harmed by the abrasive action of sand. Coverage is approximately 25,000 sq ft per 100 pounds depending on application and floor surface. 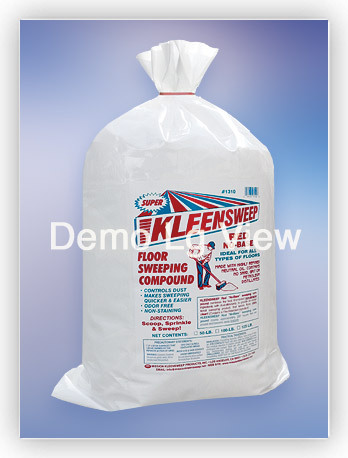 The best formulation for use on floors that can be damaged by sand or grit. 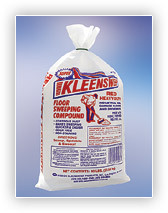 Red No-Base Kleensweep contains no sand. Ideal for all resilient floors like vinyl, glazed or unglazed tiles, hardwood floors & sealed concrete. Coverage for this product is approximately 20,000 sq. ft. per 100 pounds depending on application and floor surface. This formulation is made especially for those who require a sweeping compound for use on wood or composition floors which have been waxed. 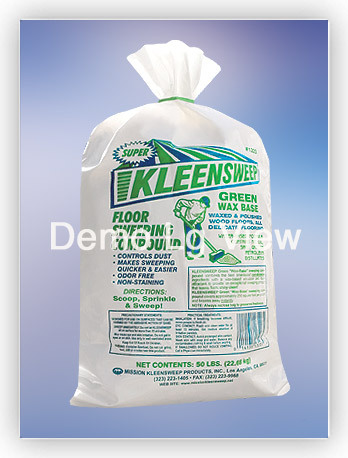 Green Wax-Base Kleensweep has been formulated in a way which is beneficial to these types of floors. 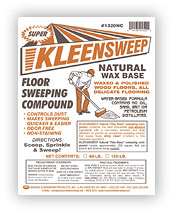 Excellent for use as general purpose floor sweeping compound. Coverage for this product is approximately 20,000 sq.ft. per 100 pounds depending on application and floor surface. 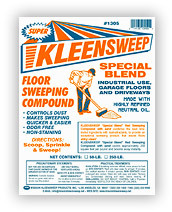 #1305 SPECIAL BLEND KLEENSWEEP - Specially formulated as an economical alternative to the #1300 Red Heavy Duty Kleensweep. Call for availability. Same as #1320 Green Wax Base but contains no color. 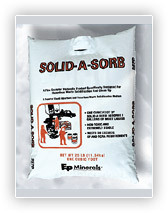 Clay absorbent, kitty litter-type, which can be used on all non-aggressive fluids and grease including solvent and oil-based spills Superior retention holds moisture in and won’t break down and turn to mud. 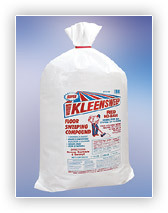 Our most economical, high quality absorbent. The fast, easy, effective way to pick-up and cover-up unpleasant, untimely accidents. 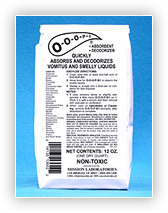 Quickly absorbs and deodorizes vomitus and smelly liquids. 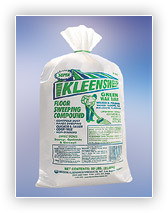 Allows for pick-up with cardboard or a dustpan for disposal. Also may help to reduce staining of carpets and fabrics. Leaves a pleasant fragrance. 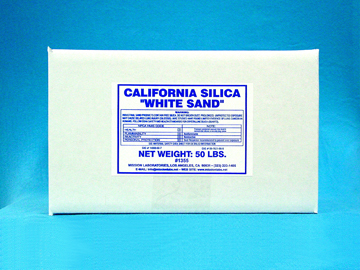 Dried and milled diatomaceous earth that is lighter in weight than clay. It’s higher absorbent capacity and low abrasion makes clean-up of oil and liquid leaks, drips, runs and spills more economical and easier to use. A premium all purpose dried and milled diatomaceous earth product. Lighter in weight than clay. It’s higher absorbent capacity and low abrasion makes clean-up of oil and liquid leaks, drips, runs and spills more economical and easier to use. Ideal for quick and safe absorbing of solvents, lubricants, cutting oils and water. 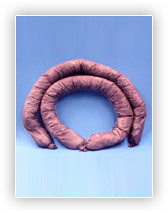 General purpose, hydrophilic, non-toxic and moldable. They absorb 14% more liquid than their original weight. 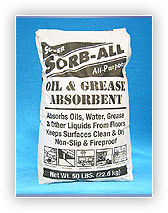 Ideal for quick and safe absorbing of all liquids from water-based fluids to aggressive acids. An absolute necessity to assist with Haz Mat spills and spill contingency planning. Bonded for tensile strength and will absorb up to 25 times its weight in liquid. Ideal for quick and safe absorbing of all liquids from water-based fluids to aggressive acids. An absolute necessity to assist with Haz Mat spill and spill contingency planning. Bonded for tensile strength and will absorb up to 25 times their weight in liquid. 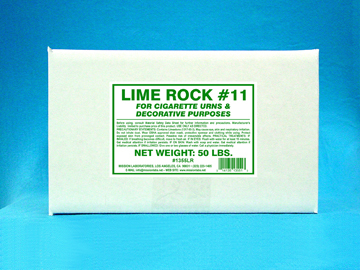 #1355LR CRUSHED LIME ROCK – Coarser alternative to decorative sand. Ideal for use in ashtrays and in all places where sand is normally used. Color: White. #1355 WHITE SAND – Pure fine-grained white sand. 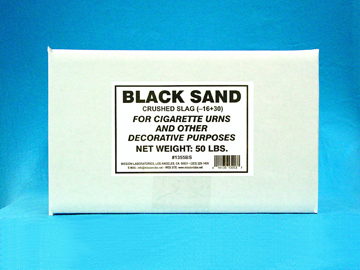 Excellent for use in ashtrays and in all places where sand is normally used. Color: Natural. #1355BS BLACK SAND – Pure fine-grained black shiny sand. Excellent for use in ashtrays and in all places where sand is normally used. Color: Black. Thank you for visiting our products page!